SUKKUR â€“ Opposition Leader in the National Assembly, Syed Khurshid Shah on Saturday said Pakistan Tehreek-e-Insafâ€™s (PTI) call to lockdown the federal capital on November 2 is â€˜illegalâ€™. 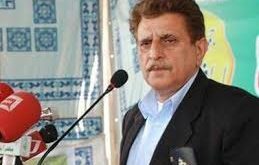 Talking to media persons in Sukkur on Saturday, he said though it is the right of political parties to stage protests and sit-ins but locking down any city or institution is contrary to constitution and law. â€œAny move to shut down a city or any institution is illegal and unconstitutional,â€ he said. Shah said PPP will be in the frontline to save and strengthen democracy as it strengthens the country. It may be mentioned here that Chairman of Pakistan Tehreek-e-Insaf, Imran Khan announced on Monday to shut the federal capital on November 2. Khan has seized on the Panama Papers scandal as a fresh opportunity to try to unseat Prime Minister Nawaz Sharif. Earlier, the former cricketing hero staged protests in Islamabad for months in 2014 over alleged electoral fraud but failed to topple the prime minister. Leaked documents from the Mossack Fonseca law firm in Panama in April showed Sharifâ€™s sons Hassan and Hussain, and daughter Maryam, owned at least three offshore holding companies registered in the British Virgin Islands. The International Consortium of Investigative Journalists, which studied the papers, said those companies had engaged in at least $25 million in property and acquisition deals. Nawaz Sharif has claimed his children have done nothing illegal, but opponents accuse the family of using the tax haven to launder stolen money and dodge taxes.